Cup Double, BL Runners-Up & World Champ Again! Team manager Pete Adams had some big changes in 1982, Dave Shields decided to stay in Australia and Bent Rasmussen stayed back home in Denmark. John McNeil joined Weymouth. 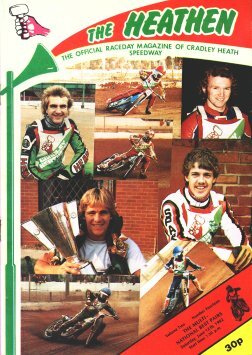 Adams first signing was Bruce Penhall's protege Lance King he was joined by Andy Reid from Glasgow and Ian Gledhill from Mildenhall, but Ian failed to establish himself in the team and was loaned out to Oxford and replaced by Jan Verner from Swindon. The Heathens carried on winning as before led by the brilliant Penhall. Before the end of March they had beaten Ipswich home and away to become inaugural winners of the Premiership Trophy. They lost only two matches in winning the League Cup Northern Region both against Coventry but again beat Ipswich home and away in the Final. The Witches must have thought that the Heathens were their bogey team as Heathens beat them again home and away in the KO Cup a month later! They went on to win the KO Cup beating Eastbourne in the semi-final and Belle Vue in the Final. By the middle of August the Heathens were again sitting on the top of the British League with 30 out of 34 points. They were odds-on favourites to retain the championship with nearest rivals Belle Vue totalling 28 out of a possible 38 points. Then one disastrous weekend Cradley's title hopes were shattered, on Saturday August 14th they dropped two vital points at Coventry when Bruce Penhall crashed in the last heat. The next day Penhall led the USA to their first ever World Team Cup win at White City. That same night a phone call from Bruce informed Cradley that he was quitting the sport to concentrate on a film career in Holywood. From that moment Cradley were knocked off course. 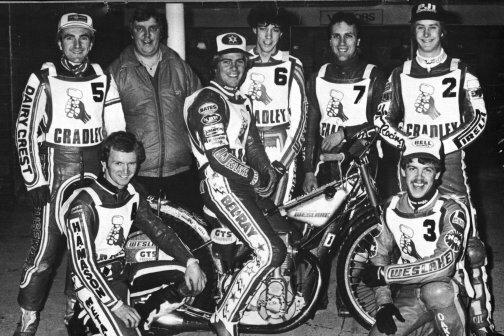 Adams introduced National League stars Simon Wigg, Steve Lawson and Ashley Pullen to cover for Penhall's absence but the plain fact was that once the World Champ had gone Cradley failed to win another match away from home. Eventually finishing second to Belle Vue in the table. Penhall went on to win his second World Championship in the Los Angeles Coliseum on August 28th, and then retired from speedway. In just five years this blond, blue eyed darling of the speedway terraces had collected virtually all the individual and team awards that speedway had to offer from the supreme prize of Individual World Champion to share the World Team Cup, the World Best Pairs, British League Championship and National and regional cups. However as the brilliant superstar moved on, another star emerged in young Erik Gundersen who reached the Intercontinental Final of the World Championship, scored 15 point maximums in both legs of the KO Cup Final and ended the season with a green sheet average of 10.72, which made him second in the table to controversial Yorkshire man Kenny Carter who won the Golden Hammer at Dudley Wood. Coventry win 79-77 on aggregate. 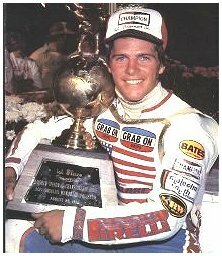 Bruce Penhall succesfully defended his World Championship crown in front of his 'home' crowd in the vast Colisium in Los Angeles California and then promptly retired from speedway on the rostrum to pursue a Hollywood acting career. He came - he saw and he conquered, the sports top prize defended, a share in the World Team Cup, World Best Pairs, British League Championship and all the National and Regional Cups. He certainly left his mark!